Trick or Treat Studios has unveiled their 2019 catalog of new and returning products that will be available this year, including our first official look at the new 1978 Michael Myers “The Shape” mask, plus lots of additional treats from the original Halloween, Halloween 4, Halloween 5, and much more. The 1978 Myers mask comes from a new sculpt by Justin Mabry, who helped create the Myers mask used in 2018’s Halloween and has designed all of the Myers masks released from Trick or Treat Studios to date. In addition to the iconic mask that adult Michael Myers wears, we are also getting new 1978 coveralls, a prop knife, the young Michael Myers clown mask and full costume, the opening credits light-up jack o lantern, Judith Myers tombstone, life-size static Myers prop, Myers Ghost costume, and officially licensed Laurie Strode and Sam Loomis costumes, all also from the original Halloween. 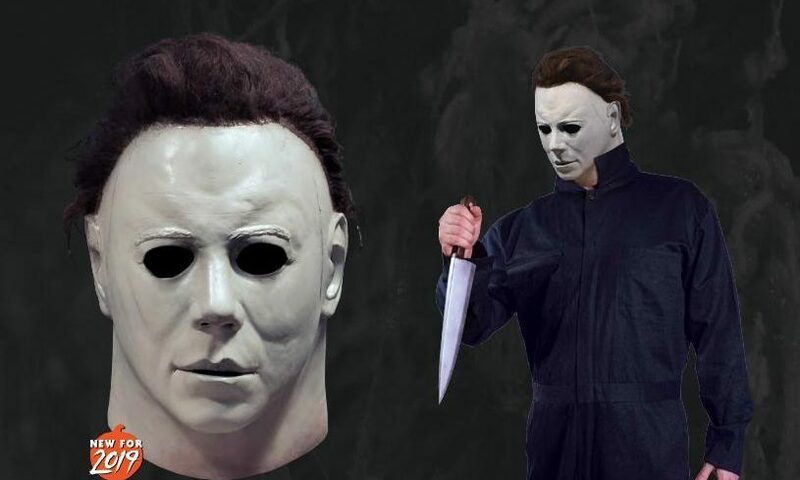 Other highlights that are new for 2019 include the Myers mask and Jamie Lloyd clown mask and costume from Halloween 4, the Myers mask from Halloween 5, and even the Brute mask that Michael puts on after killing Tina’s boyfriend Mike in H5. Also new for 2019 is the Halloween II opening credits light-up jack o lantern and Haddonfield Memorial Hospital metal sign, Halloween III Final Processing metal sign, Halloween 5 thorn temporary tattoos, Halloween 6 light-up jack o lantern prop, and Halloween 2018 Final Battle (Bloody Edition) Myers mask, coveralls, kitchen knife prop, dead eye latex appliance, and Officer Francis (Chris Nelson) head prop. Michael Myers and Halloween are also featured among the new retro-styled wall decor and Holiday Horrors Christmas tree ornaments. As an officially authorized retail seller of Trick or Treat Studios products, we will have the newest Halloween masks to be released in 2019 available for sale in our online store as soon as we are allowed to take pre-orders. All new 2019 products are expected to begin shipping this fall. You can see all of the new for 2019 (and returning) releases from the Halloween movie franchise below, and keep watching Halloween Daily News for more reveals of other upcoming 2019 masks from Trick or Treat Studios. ‘Halloween’ Cinematographer Dean Cundey Supervising New Blu-ray Transfer!